Carpenter Ballard Holt (1837 – 1925) and brick mason Walter Allen (1831 -1891)likely worked together in Andover before the War. They were mustered together in September 1862 into Company G of the Massachusetts 44th Regiment, along with twelve other Andover men (including the five Marland cousins, and the Raymond brothers). They left Boston on October 2, 1862, escorted to the steamboat with a parade down Boylston Street led by the full Gilmore Band. They served their nine-month enlistment with this regiment in North Carolina. They were both re-mustered in August 1864 as replacements in the Massachusetts 11th Infantry. With this regiment, they were at Petersburg in the fall of 1864, and in the pursuit of Lee’s Army in April 1865. They were near Appomattox the day of the surrender. 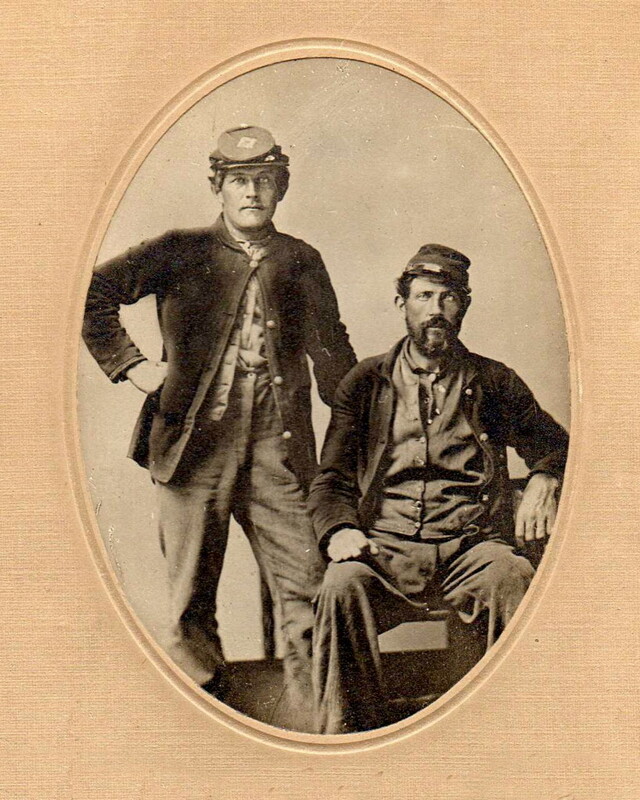 Discharged in July 1865, they had this photo taken in New York on their way home. Ballard Holt was married in 1868 to Delia Lafferts and moved from his family’s ancestral home on Holt Hill into homes on Maple and Central Streets. As a reward for his service, he was appointed in 1873 the first librarian and janitor of the new Memorial Hall Library. He died in 1925 and is buried at Spring Grove Cemetery. Walter Allen was married to Eliza Findley in 1857. He worked as a mason in Andover after the War and in 1890 was appointed Superintendent of the Town Almshouse. He died in 1891 and is also buried at Spring Grove.